U.K. Parliament Votes To Postpone Brexit Parliament approved a government plan to ask the European Union for an extension until June 30. European leaders will consider the request at a summit next week in Brussels. 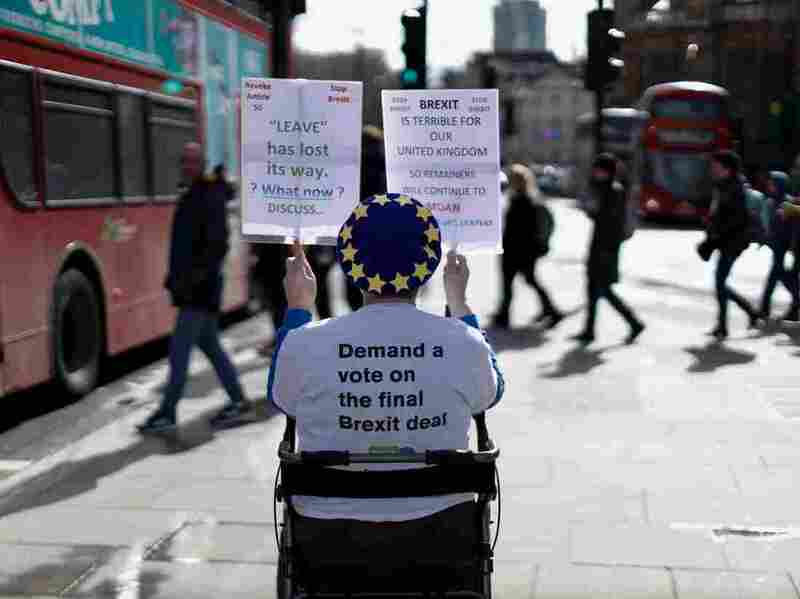 An anti-Brexit activist demonstrates outside of the Houses of Parliament in London on Thursday, before a vote on whether to postpone Britain's exit from the European Union. Prime Minister Theresa May plans to bring her withdrawal deal before Parliament for a third time on Wednesday, following two humiliating defeats of her plan. If her deal passes, the government will need an extension in order to sort out all the legislation needed for the U.K. to leave. If May's deal is defeated a third time, then the prime minister says she will have to ask EU leaders for a much longer extension, which also might not be approved by the EU. The difference between a short delay and a long one could be significant. A longer extension could mean time for a second referendum on Brexit or even a general election that could push May's Conservative Party from power. May is in favor of only a short delay, if any. Her deal is set to go up for a vote the day before an EU Summit in Brussels, at which member nations would vote on Britain's request to delay Brexit. All 27 of the other EU members would need to approve any extension. Britain will need to show how it could use more time to find a way forward, when it has so little to show for years of political infighting since the June 2016 referendum on Brexit. "The EU has done everything it can to help get the Withdrawal Agreement over the line," the EU's chief negotiator, Michael Barnier, said after a second vote on May's deal failed this week. "The impasse can only be solved in the UK. Our 'no-deal' preparations are now more important than ever before." If May's deal fails a third time, the U.K. would likely need to ask for even more time to work out a deal. Donald Tusk, president of the European Council, tweeted on Thursday that he "will appeal to the EU27 to be open to a long extension if the UK finds it necessary to rethink its Brexit strategy and build consensus around it." Brexiteers see Tusk's "long extension" as a threat designed to force them into backing May's plan. The pressure on May to deliver any sort of resolution – or perhaps step down — is growing. And it's been a very long week for the embattled prime minister. On Tuesday, Parliament soundly rejected the plan she had worked out with the EU. The vote was 391-242. Wednesday's vote was on whether Britain should leave the EU without a deal at the end of March — or any day in the future. The answer was no, by 321 votes to 278. That was no surprise: many worry that leaving the EU without a deal will plunge Britain into chaos, with goods held in limbo and the possibility of food and medicine shortages. May is desperately urging Parliament to approve the deal she has brokered with the EU, warning that a better deal will not be forthcoming. Members have shown what they're against, she says, but have not said what they're for. Her own party is fracturing, as evidenced by the failure of her proposals this week as well as resignations and abstentions within her own Cabinet. A group of arch Brexiteers continues to push for a hard Brexit — not only leaving the bloc, but also the EU's single market and its customs union. A key sticking point in any Brexit deal has been how to avoid a hard border — including customs inspections — between Northern Ireland (part of the U.K.) and Ireland (a member of the EU). In an effort to ensure that border stays open, the U.K.'s withdrawal agreement includes a measure known as the "Irish backstop" that would keep the U.K. effectively within the EU customs union and Northern Ireland part of the single market. But some worry that the backstop would end up permanently locking Britain into the EU customs union. The prime minister got some reassurances from EU leaders on Monday night that this wouldn't occur, but the U.K.'s attorney general said Tuesday that the possibility of the backstop becoming permanent had not been eliminated. For some members of Parliament who had been weighing whether to support May's deal, that opinion sealed their opposition. May's strategy in recent months has been a risky one: Waiting until the last moment to try to force through a plan when the stakes cannot get any higher. That last moment has arrived.